By viktoria art, an amazing girl! Natalya lituta, an amazing price for a costumed doll! A clown by Natasha Yaskova, one day left, no bids, currently under $200! Another find! 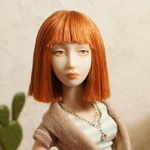 This doll is a great price and her face is so sweet! I hope someone here gets her. A new artist for the forum as well, Bykadorova Olha. Oh yes, she is a real one ( not mine though). So Elcatka is selling the doll and that's her eBay account? sure it isn't someone else posing as her? Normally elcatka puts a lot more labeling unless someone else purchased the doll and put it up on ebay. Wish I could buy her, I would totally go for her if I had the money right now. Either way would like to double check the credentials. Just saw this pretty doll on eBay. Anyone knows this artist? Oh yes,Kristina Kuntz(Precious Secrets).She's an american artist,has two adorable daughters and make porcelain Bjd dolls.This doll is second one from the series. Oh I would love her! My purse can't do it though! !